No practice. No rubbing out. And don’t spill anything. 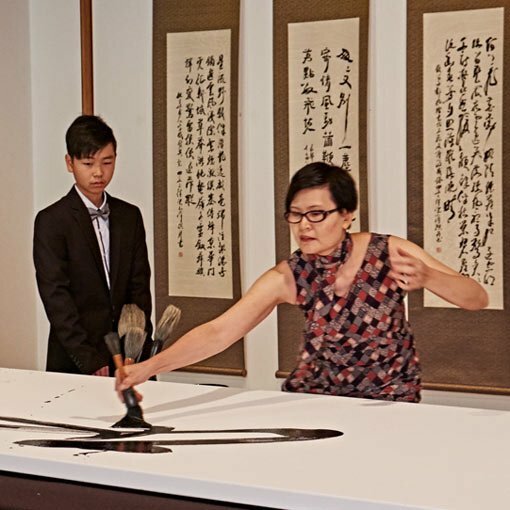 These were some of the challenges artist Liang Xiao Ping faced recently when writing calligraphy in acrylic and Chinese ink across an 11-metre length of stretched canvas in the Art Gallery of NSW. ‘You don’t have enough time to think about it. It’s spontaneous,’ Xiao Ping says of the largest commission she has ever undertaken, which is on display in the upper Asian gallery during the exhibition Tang 唐: treasures from the Silk Road capital . The characters are a poem written by Tang Emperor Taizong (598-649) about his grand capital, Chang’an, present-day Xi’an, where the more than 130 objects on display in Tang were uncovered between the 1950s and the 2000s. Han Vale lends might to the august dwelling. Touring palaces, a hundred spans and more. Soaring belvederes remotely pierce the void. Wind and mist emerge from the figured tracery. Of all the traditional arts of China, calligraphy is the most esteemed and it was in the Tang era that calligraphy and poetry first flourished. ‘Master Liang’s work is very contemporary, but deeply rooted in traditional Chinese calligraphy,’ says the exhibition’s curator Yin Cao. To work at this scale, Xiao Ping says she had to ‘use something like tai chi, harnessing the energy of the body’ to achieve the shifts in direction, intensity and speed the writing of each character required. A prodigy who started learning calligraphy aged 5, Xiao Ping moved to Australia as an adult in 1987. Her style has since been described as ‘painting within calligraphy, calligraphy within painting’. A hanging scroll by Xiao Ping entered the Gallery’s collection in 1996, while her work also graces the cover and title page of the Tang exhibition catalogue. Watch a video of Xiao Ping writing the Tang poem in the Gallery. A version of this post originally appeared in Look, the Gallery’s members magazine.